Huawei P30 Pro vs Galaxy S10 Plus vs iPhone XS Max: which large phone is right for you? Huawei has announced its Huawei P30 range, and the largest device is the P30 Pro, Huawei’s competitor to the Samsung Galaxy S10 Plus and Apple’s iPhone XS Max. Each of these phones has unique and powerful features, and different ways they outclass each other, but depending on your needs one might be a much better fit than the others. That’s why we’ve put these three plus-sized handsets head-to-head, to help you decide which is best for you. As each device is the biggest in their respective ranges, you won’t be surprised to hear that they’re all large – but there isn’t a lot of difference size-wise between the three phones themselves. The iPhone XS Max, at 157.5 x 77.4 x 7.7mm and with a weight of 208g, is the biggest phone – but only just, as the Samsung Galaxy S10 Plus measures 157.6 x 74.1 x 7.8mm, although there’s a bigger weight difference as the Galaxy S10 Plus weighs in at 175g. In comparison the Huawei P30 Pro measures in at 158 x 73.4 x 8.4mm so it's fatter but shorter than the other phones, and closer to the iPhone XS Max in weight at 192g. In terms of materials, each phone is protected by a sturdy glass front and backs with metal frames, and they're all IP68, which means they're protected from dust and can be submerged to depths of up to 1 meter. The biggest phone of the bunch in terms of screen size is the iPhone XS Max with its 6.5-inch display, which tops the Samsung Galaxy S10 Plus at 6.4 inches and the Huawei P30 Pro at 6.47 inches by just a fraction. 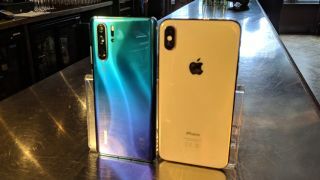 You’re going to lose some of this real estate for the camera though – both the iPhone XS Max and Huawei P30 Pro have a ‘teardrop’ notch that juts down from the top of the display, and the Samsung Galaxy S10 Plus has a ‘punch-hole’ camera that’s cut out of the screen itself. This close race between the three screens extends to the tech and resolution. The Samsung Galaxy S10 Plus has a curved AMOLED display and it offers a Quad HD+ resolution, although its default setting is Full HD+. The Huawei P30 Pro has an OLED display which is Full HD+ too, and the iPhone XS Max also has an OLED screen with Apple’s Super Retina HD. With its AMOLED screen and QHD+ resolution, we found the Samsung Galaxy S10 Plus had the most vivid colors and brightness, although that’s a subjective verdict and your experience with the phones could differ. One of the perks of a bigger phone is having a bigger battery, and fittingly each phone has a power pack that would put its smaller siblings to shame. Of the trio, the iPhone XS Max has the lowest battery capacity at 3,174mAh, which goes up to 4,100mAh in the Samsung Galaxy S10 Plus and higher still for the Huawei P30 Pro with its 4,200mAh power pack. A bigger battery doesn’t necessarily mean a longer battery life, but in our experience devices with batteries as big as the P30 Pro and S10 Plus will usually easily last a full day of use and end with a big chunk of battery left, although they’re unlikely to stretch to two full days. The iPhone XS Max should also last a day, but is unlikely to have as much juice left over. Charging is important for your handset too, and each phone powers up in different ways. The iPhone XS Max supports both fast and wireless charging, although we found it the slowest to charge of the bunch. The Samsung Galaxy S10 Plus meanwhile supports faster charging than the iPhone XS Max, and has a ‘Wireless Power Share’ feature, which means you can charge other compatible devices using the S10 Plus, while the Huawei P30 Pro more or less matches the S10 Plus for fast and wireless charging speeds. The battery life on the Galaxy S10 Plus and Huawei P30 Pro is similar, both in terms of capacity and charging speeds, so it’s hard to pick between the two – but if you don’t have long to charge your phone, or need to use it for ages without charging at all, the iPhone XS Max pales in comparison to its competitors. With both the Samsung Galaxy S10 Plus and iPhone XS Max you’re getting exactly the same rear camera setup as their smaller siblings, the Galaxy S10 and iPhone XS. The Galaxy S10 Plus has a 12MP variable aperture main sensor which can switch between f/1.5 and f/2.4, plus a 12MP f/2.4 telephoto lens and a 16MP f/2.2 ultra-wide lens, while the iPhone XS Max has a 12MP f/2.4 telephoto lens like the Galaxy S10 Plus and a 12MP f/1.8 wide-angle lens. The Huawei P30 Pro, however, is a step above the Huawei P30. It has a massive four-lens rear camera setup, consisting of a 40MP f/1.6 main sensor, which Huawei calls Super Spectrum as it picks up light better, a 20MP f/2.2 ultra-wide lens, an 8MP f/3.4 ‘Periscope’ lens for 10x optical zoom, and a time-of-flight lens to help the camera measure depth for better bokeh shots. Having more cameras doesn’t necessarily mean a phone is better for photography, and good pictures are so subjective that it’s really up to you to decide which device takes photos you prefer, but for a good example you can check out our iPhone XS review, our Samsung Galaxy S10 Plus review, and our hands-on Huawei P30 Pro review. To the front the iPhone XS Max has a 7MP camera while the Huawei P30 Pro has a 32MP selfie cam and the Samsung Galaxy S10 Plus actually has a dual-lens snapper, consisting of a 10MP main lens and an 8MP depth-measuring lens to take pictures with accurate bokeh. Under the hood the Samsung Galaxy S10 Plus is powered by a Snapdragon 855 chipset in the US and an Exynos 9820 elsewhere, while the iPhone XS Max has an A12 Bionic chipset and the Huawei P30 Pro uses a Kirin 980. It’s a little hard to compare the chipsets since they’re made by different companies, and therefore not directly comparable, but they’re all top-of-the-line processors that would beat the competition in a heartbeat. There is a clear distinction in terms of RAM, as the iPhone XS has 4GB while the Huawei P30 Pro and the Samsung Galaxy S10 Plus have 8GB (or 12GB if you splash out for the largest S10 Plus), but RAM doesn’t always mean faster performance. One major difference between the iPhone XS Max and the other two phones is that it runs iOS 12, while the Samsung Galaxy S10 Plus and Huawei P30 Pro both run Android 9 Pie, although the P30 Pro and S10 Plus both have their own different user interfaces that run over the top of Android Pie. Operating system is a subjective way to differentiate between phones, but some people have their preferences, so it’s worth staying informed. As the larger siblings of already high-end flagships, you can’t expect any of these devices to be cheap. If you really do want to splash out, the iPhone XS Max costs the most at $1,099 / £1,099 / AU$1,799 for a model with 64GB of storage, $1,249 / £1,249 / AU$2,049 for 256GB or $1,449 / £1,449 / AU$2,369 for 512GB. If that’s a bit too much for you, the Samsung Galaxy S10 Plus is a little cheaper. For 128GB of internal memory you’ll be paying $999 / £899 / AU$1,499, if you need 512GB of storage that’s $1,249 / £1,099 / AU$1,849, and if for some reason you want 1TB of storage and 12GB of RAM that’s $1,599 / £1,399 / AU$2,399 – the latter is seriously expensive, but you’re getting a lot of power for your money. The Huawei P30 Pro costs exactly the same as the Galaxy S10 Plus in the UK, costing £899 for the 128GB version at £1,099 for 512GB, although it won't be available in the US and may cost different in Australia. Since the Huawei P30 Pro, Galaxy S10 Plus and iPhone XS Max all have various strengths and weaknesses, it’s not easy to say one is necessarily better for you, especially since the choice will be influenced by your opinion on phones – if you’re a die-hard iOS fan, the choice is easy for you. The new Huawei P30 Pro has a powerful camera array, but you’re not going to have the best possible screen resolution. The Samsung Galaxy S10 Plus meanwhile has a great screen but you’re getting different internals depending on where you buy it in the world, and the iPhone XS is the most expensive device but it’s the only way you’ll be getting to use iOS 12. None of these phones is necessarily better than any other, but depending on what you need one might be better for you than the others – but make sure to check out our full reviews of each if you’re still unsure which is best for you.